Welcome to my blog. I try to write about my adventures in travel, food and coffee. 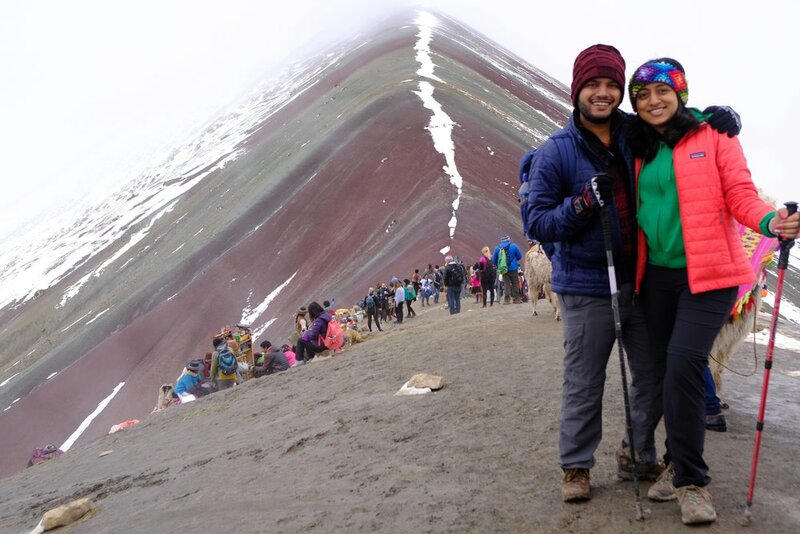 Rainbow mountain or Vinicunca, also called Montaña de Siete Colores, Montaña de Colores is a mountain in Peru with an altitude of 5,200 meters (17,060 ft) above sea level. As the name indicates, these mountains are colorful. There are different reasons why the Vinicuna or Rainbow Mountain is striped with colors ranging from turquoise to lavender to maroon and gold. However, they are largely due to weathering and mineralogy. It’s about three and a half hour drive from Cusco. 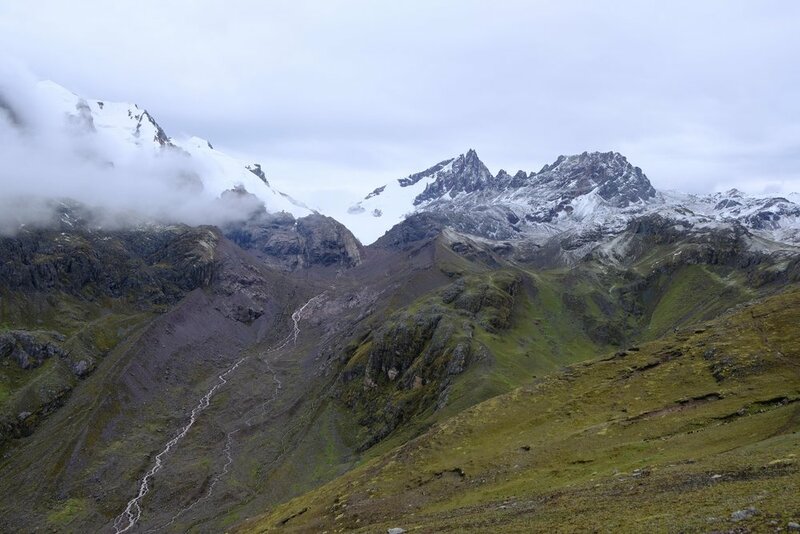 During our Peru trip in December 2018, Meera and I hiked this mountain. This was the highest mountain we have ever climbed with the summit at 17,060 ft (5200m), it was truly exhilarating. 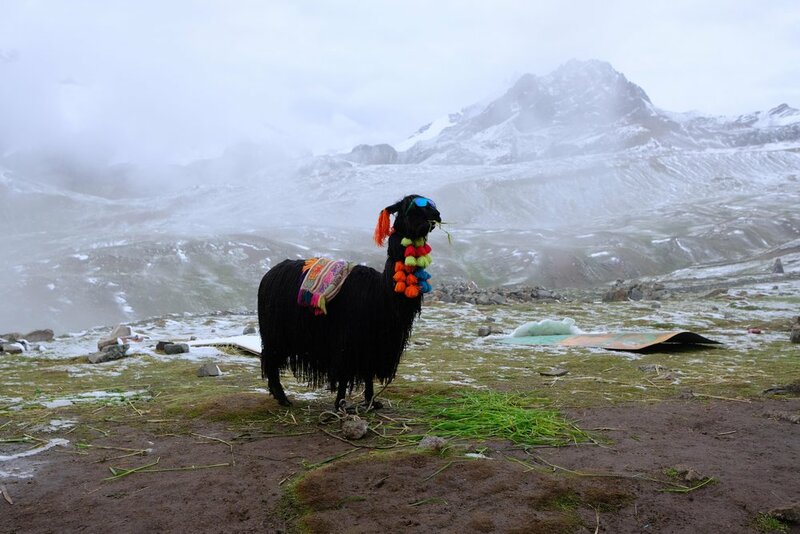 In Peru, for most hikes you need to have a guide with you. There are many local agencies in Cusco who operate day trips to hike the Rainbow Mountain. If you want to beat the crowd, they typically pick you up from your hotel around 3:00 am in the morning, and drive towards the trailhead. We chose this option for our hike. An hour before the trailhead, we were provided with breakfast and picked up water/snacks for our hike. After this, we started driving to the trail head and the road to get there will sure spike your adrenaline and heart rate. It’s basically an hour on an almost non existent road with no pavements with breathtaking scenery and huge mountains around. The sheer size of these mountains will make you wonder how small we are. 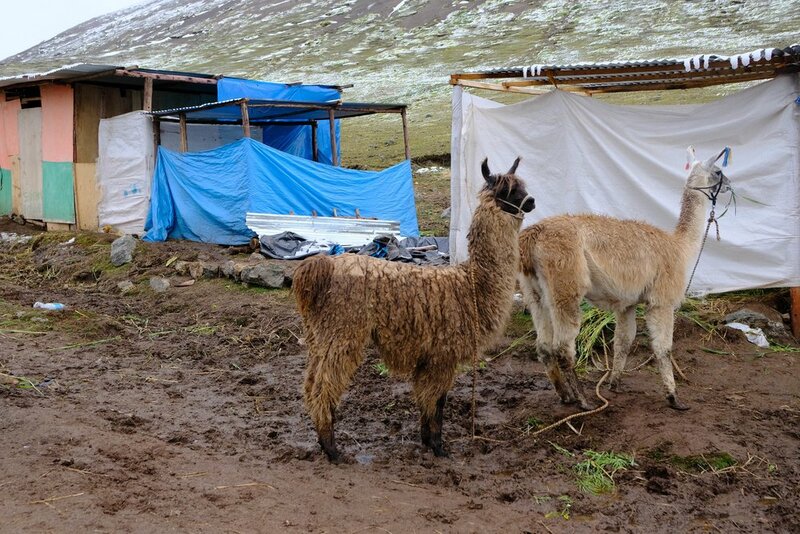 We saw many wild alpacas, llama’s, andean horses on the way. The weather was playing its tricks with fog rolling in and out. It’s also important that you are dressed appropriately for this hike with proper layers as the weather can quickly change. 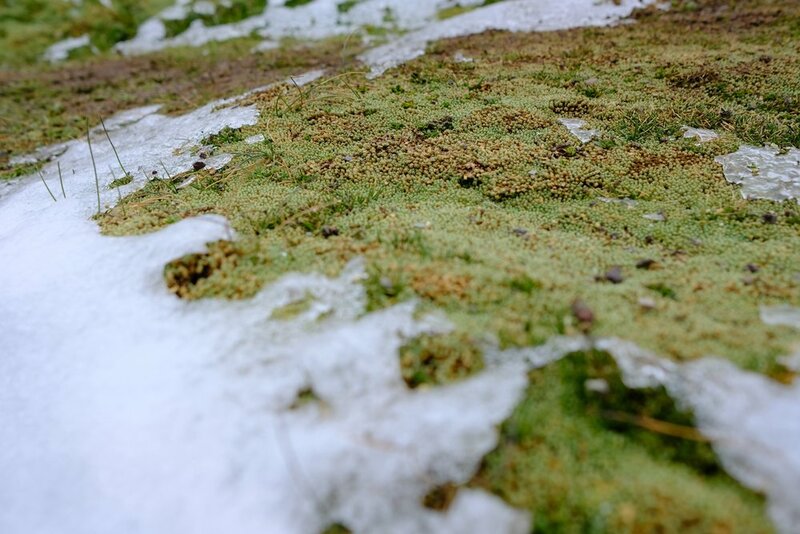 It briefly snowed and rained for a bit during our hike. We roughly arrived at the trail head around 8.00 am. When we arrived there were only two other cars and no crowd which was good. We used the restroom here as there are no restrooms for the next couple of hours. The restroom’s are porter potty type, just clean enough to take a leak. We paid 1 soles each to use them, so make sure you have cash with you. Note the trailhead is at 14,000 ft. We already felt the slight signs of less oxygen levels. The clearest indication was that we started to feel exhausted and out of breath for just walking 50 meters. We eventually got acclimatized after ~15-20 mins of walking and got our bodies warmed up. For people who don’t want to hike, you have an option of riding on a horse. The horse takes you close enough, however the last 45 mins of the hike you need to hike. The prices are negotiable and its cash only. I think it was around 150 soles one way. 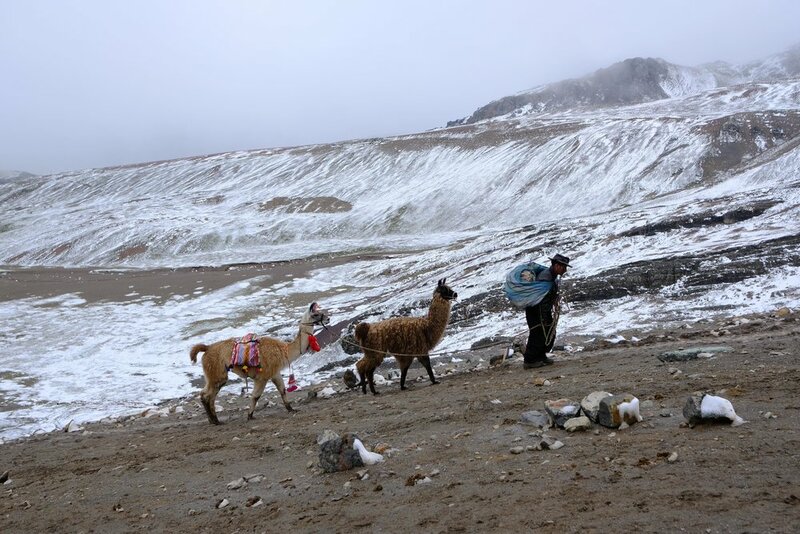 The locals come here for work mainly to sell some coca tea, snacks and walk their horses, llama’s and alpacas. They are super friendly and Meera got a picture with them. We finally started to hike and paced ourselves slowly. The views throughout the hike are magnificent and no amount of pictures do justice. 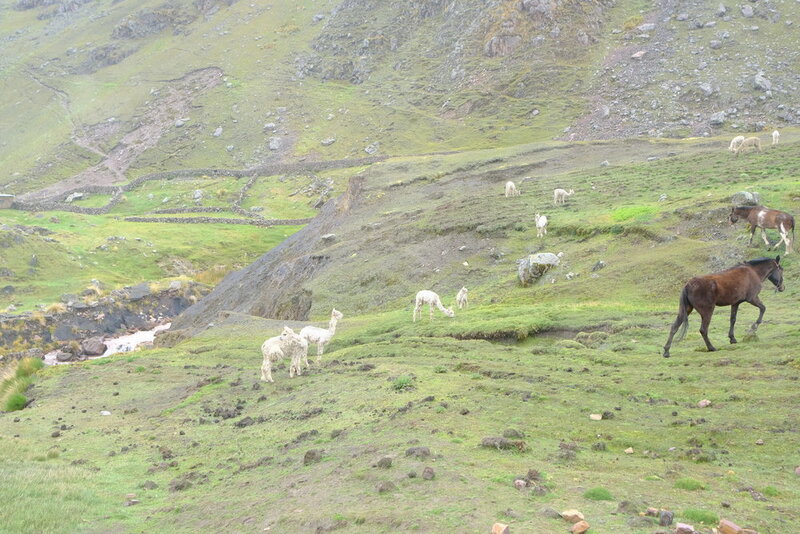 We also saw some cute llama’s on the way. We managed to get a close up with one of them who was named Elvis Presley. Depending on your fitness levels, the entire hike can take anywhere up-to 4-5 hours to get to the summit. Getting back is easy and it doesn’t take as much time as going up. We definitely felt the lack of Oxygen affecting our bodies as our muscles were tiring super fast and were getting exhausted. It felt like forever to get to the summit, but with sheer determination and will we eventually made it. After a grueling four hours we were at 17,060 ft (5200m). The last hour of the hike was the hardest and really tested our endurance. 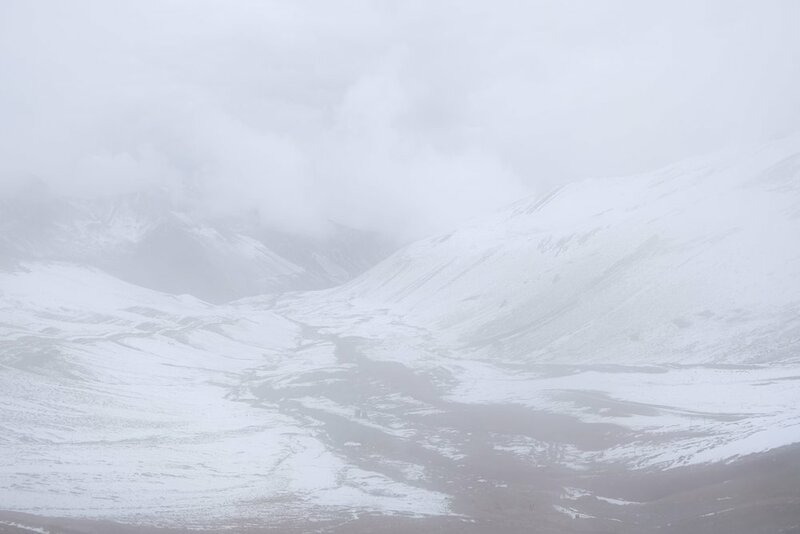 We spent around 15-20 minutes at the summit and it was recommended to not spend more time there because of the altitude we were at. The weather changed drastically as well and started to get chilly. It snowed a bit and drizzled for a while. We started to quickly head down. The total approximate roundtrip time for us was around 6 hours and we were back at the parking lot by 1 PM in the afternoon. We started heading back towards Cusco with a quick lunch break on the way. We were back at Cusco by 5 PM in the evening. If you are interested you can also check out my highlight for this trip on instagram. ** all the pictures in this post are from my camera.